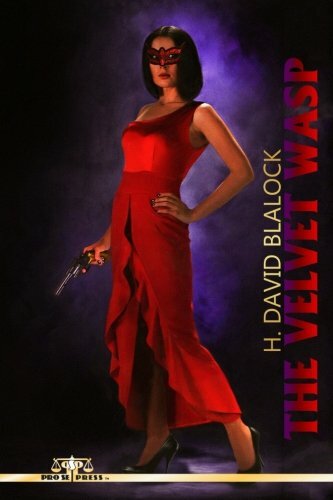 Noted author H. David Blalock enters the world of New Pulp and masked heroes with THE VELVET WASP, a brand new collection of short stories featuring his own original Pulp Heroine! A nightclub entertainer named Adele Fornost has been found dead, an apparent suicide. Her friend, another entertainer named Diane Green, is convinced that she was murdered and that the Outlander Mob is behind it. Known for racketeering, prostitution, and money laundering, the Outlanders are run by a man known only as Sir. Diane is unable to convince the police to take on the case and decides to take matters into her own hands. Although she is able to get the goods on the Outlanders, she has to fake her own death to do it. Thus, Diane Green dies, but the Velvet Wasp is born to take flight in four adventures, courtesy of H. David Blalock and Pro Se Productions. With a captivating cover and logo design by Jeffrey Hayes and print formatting by Marzia Marina and Antonino Lo Iacono, THE VELVET WASP is available now at Amazon at https://www.amazon.com/Velvet-Wasp-H-David-Blalock/dp/197927326X/ref=tmm_pap_swatch_0?_encoding=UTF8&qid=1515985175&sr=1-1 and Pro Se’s own store at www.prose-press.com for 14.99. This action packed collection is also available as an Ebook, designed and formatted by Lo Iacono and Marina for only $2.99 for the Kindle at https://www.amazon.com/Velvet-Wasp-H-David-Blalock-ebook/dp/B0773DGTN4/ref=tmm_kin_swatch_0?_encoding=UTF8&qid=1515985175&sr=1-1. This book is also available on Kindle Unlimited, which means Kindle Unlimited Members can read for free. For more information on this title, interviews with the author, or digital copies to review this book, contact Pro Se Productions’ Director of Corporate Operations, Kristi King-Morgan at directorofcorporateoperations@prose-press.com. DEATH MEETS THE PRIVATE EYE! METAPHYSICAL MYSTERY ‘NIGHTINGALE’ DEBUTS! NICHOLAS BOVING’S ESPIONAGE MAN OF THE OCCULT RETURNS- ‘MAXIM GUNN: SHEBA’S NECKLACE’ NOW AVAILABLE!